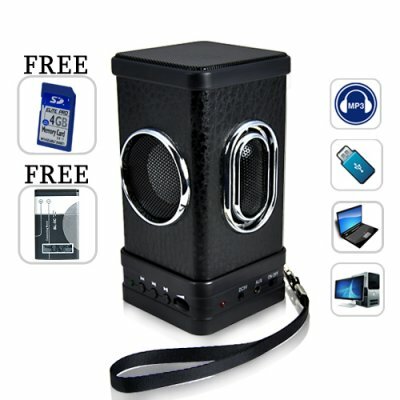 Successfully Added Speaker Amore - Mini Speaker with MP3 Player Function (USB, SD) to your Shopping Cart. You WON'T believe the remarkable sound this mini speaker outputs. Surprisingly powerful and stunningly clear, The Speaker Amore handles deep bass and sharp tones like a pro for a brilliant stereo performance of the highest highs and the lowest lows everytime! Hear it for yourself and you'll agree that this baby sounds better than speakers double or triple its price. In fact, you'd swear it was made by Bose, B & W, JBL or some other expensive speaker manufacturer! But wait! Here's an innovative first - a mini-speaker powered by a rechargeable cellphone battery. Yes, The CVBW-K85 is powered by a single Nokia BL-5C rechargeable battery (included free). This powerful LI-ION battery (made for the Nokia N-Series phones) is lightweight and slim, and designed for extended use. But the K85 Speaker Amore sells for a mere fraction and comes in a complete space saving form factor! Don't delay - we'll express ship it tomorrow if you order today. Better yet, list it on your online store and we'll dropship to your customers so you can conveniently lock in a nice profit. Brought to you by the leader in online electronics - Chinavasion. More great news! Included in the 4GB SD card is our Chinavasion sampler collection which features hit songs from our videos and more! Comes with a free 4GB SD card preloaded with our Chinavasion sampler compilation, a great listening experience made up of hit songs that have been used in our product videos and lots of other tunes! It works like expected, and delivered in 3 days (in Switzerland) after the order.